Today I wanted to share a few ways we are welcoming spring into our home. Cleansing our air. The air inside our homes is 5-7 times more toxic than the outdoor air! Stay-at-home parents or people who work from home are twice as likely to develop cancer. So, being intentional about the quality of our air is so important! In order to fight what feels like a loosing battle, we are opening windows and circulating the air as much as the weather permits. We are also doing LOTS of diffusing of essential oils to cleanse and purify our air. I love that they are also supporting our immune systems and emotions at the very same time. Cleaning // We use Thieves Household Cleaner + several other essential oils (i.e. Lemon, Purification, Tea Tree, Kunzea, etc.) for almost all of the cleaning in our home. Thieves cleaner is a highly concentrated plant-based formula that we dilute and use on every surface of our house. I dilute Thieves by adding a cap full to a 16 oz. glass spray bottle (I have linked all of my favorite bottles and such HERE)! I will be sharing some more of my favorite (and supa-easy) cleaning DIYs in an upcoming blog post. Freshen up the bed linens // pack away the flannel sheets and the down comforters for the season and pull out the cotton sheets + light quilts. To give the new bedding a freshening up, spritz them with a DIY Linen Spray. Add 5 drops each of Lavender + Bergamot + Chamomile + Balsam Fir to a glass spray bottle. Add a squirt of witch hazel and fill the rest of the bottle up with distilled water. Spray on bedding, fabric furniture, rugs, throw pillows, etc. (especially right before company arrives!). Beauty routine // I am over this dull, winter skin! Essential oils are a natural way to help moisturize & rejuvenate, so here are some of my favorite ways to use essential oils in my beauty routine. Glow Serum: 20 drops Frankincense + 20 drops Copaiba + 10 drops Geranium & topped with Jojoba Oil or Rosehip Seed oil in a 1oz dropper bottle. I wear Joy essential oil on my wrists as a daily perfume. Traditional perfumes are full of hormone-disrupting chemicals, so I opt for my mood-boosting plant juice. I use YL Rose Ointment on chapped lips + elbows and heels + cuticles to be summer-ready! I’m adding Lavender or Rosemary essential oils to my shampoo to condition and strengthen my hair. To help get my legs summer-ready, I add a couple of drops of Cypress essential oil to my body lotion to get the blood circulating. My all-time FAVORITE non-toxic body lotion is YL’s Genesis hand & body lotion. Sleep // This is definitely something I diffuse all year long, but my favorite sleep blend just smells like Spring so I’m sharing it here. My favorite way to wind down at night and prepare for a restful sleep is to add 2-3 drops each to my diffuser as I’m getting ready for bed: Frankincense + White Angelica + Orange. For my boys, I like to add Peace & Calming to their diffusers. A few simple tricks // Keep your flowers fresh with 2-3 drops Purification in your vase of water. 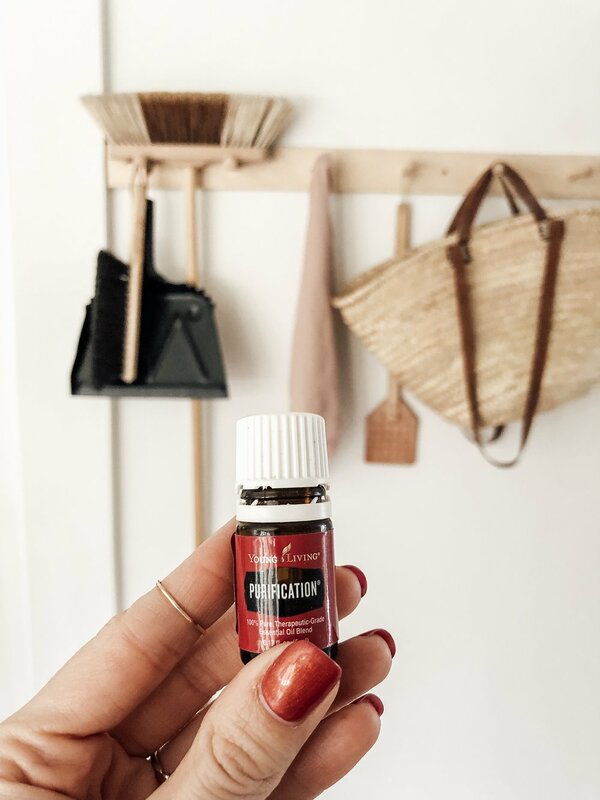 Add a couple of drops of Purification to cotton balls or those felt furniture leg pads and stick them in the bottoms trash cans, diaper pails, shoe closets, sock drawers, etc.). 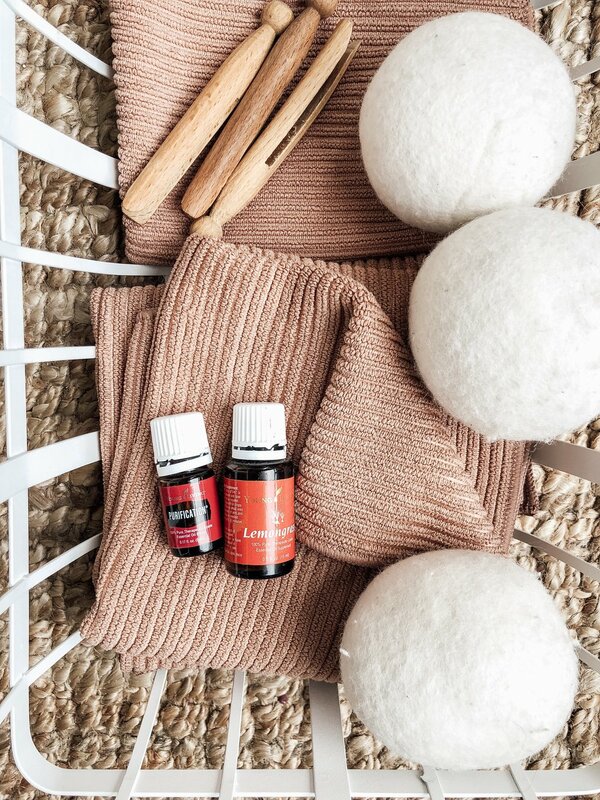 Add a few drops of Lavender to wool dryer balls in place of dryer sheets to keep laundry fresh & smelling amazing. And a few drops of Peppermint + Lemon added to a small spray bottle with water + a splash of witch hazel will help keep all the ants away. If you are interested in learning more about essential oils, you can read more here!